I love using safe and natural cleaning supplies but sometimes life gets in the way of best intentions. It’s OK to let go of the guilt and self-imposed expectations to stop making your own DIY natural cleaning supplies. 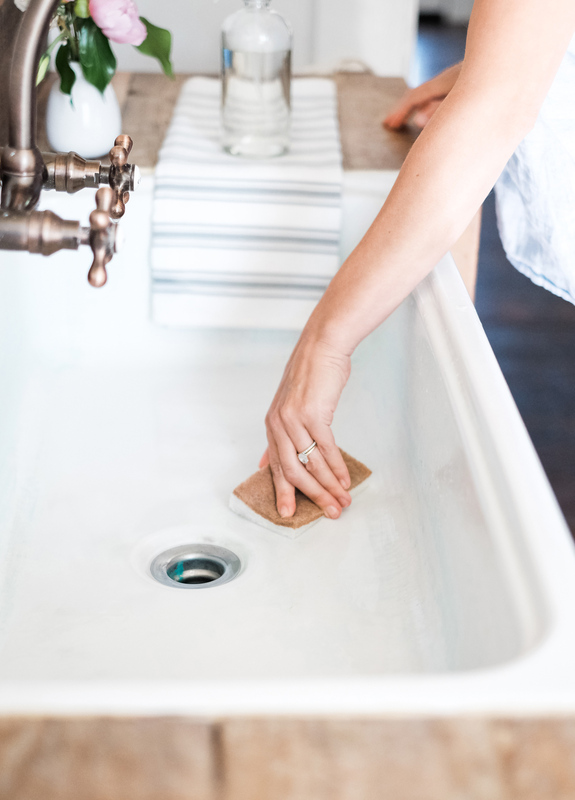 You can still clean safely, effectively and on budget with a few well-priced store-bought options. 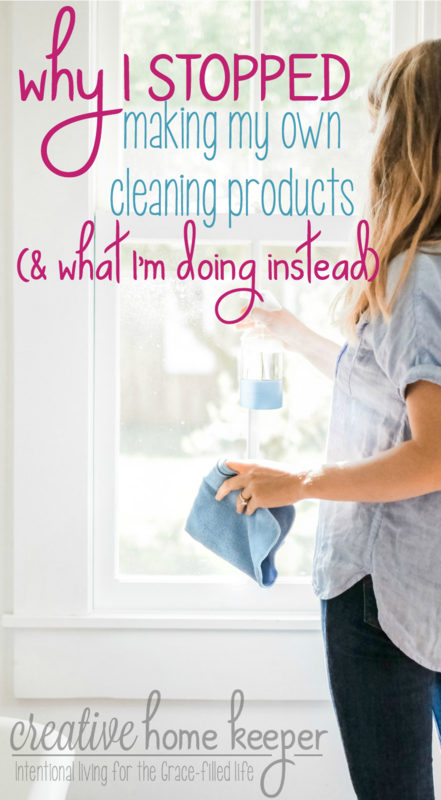 I kind of feel guilty for writing this post, for sharing that I’m not currently making my own cleaning supplies after I’ve shared in the past why I do. I used to be a big proponent of making your own cleaning supplies (in truth, I still am) but lately, I’ve just needed to simplify my life as much as possible. And choosing to be intentional means to make smart, simple choices that match your values and what is most important to you. Being a mother to three young children, managing our home, and running the blog and business takes a lot of my time, focus, and energy. My kids are constantly changing and growing. Now that we are in the season of kids attending school, our calendar is busy. When one milestone is reached, another child is going through a stage that zaps our energy and leads to exhaustion. When I feel like I’ve finally got a handle on one thing, another challenge or routine change comes up leaving me feeling like I’m running on a never-ending hamster wheel. I know as long as my children are living under my roof, life will always be hectic and crazy but despite the exhaustion, feelings over overwhelm and frazzle, I wouldn’t wish these days away for anything. Our life is crazy, hectic and fast-paced (and OK some days I do feel like I’m going to lose my ever-loving mind) BUT our life is so full too. The days are filled with more joy than I can handle (despite the sleeplessness, temper tantrums and never-ending laundry piles). All of this lead me to really think through some routines and practices I had in place and was running myself ragged trying to keep up with. Some seasons you just have to wave the white flag of surrender and realize what worked in the past, and what very well may work again in the future, just doesn’t work right now. Rather than beating ourselves up about it or feeling guilty that we aren’t doing the things we should be, giving ourselves grace to simplify and let go really is the best thing. One of the things that I had to let go was making my own cleaning supplies. It was something I just couldn’t keep up with. I was tired of opening the pantry that houses all of the cleaning supplies to see lots of little bottles, odds, and ends, and other miscellaneous items I would use to make my cleaning supplies. 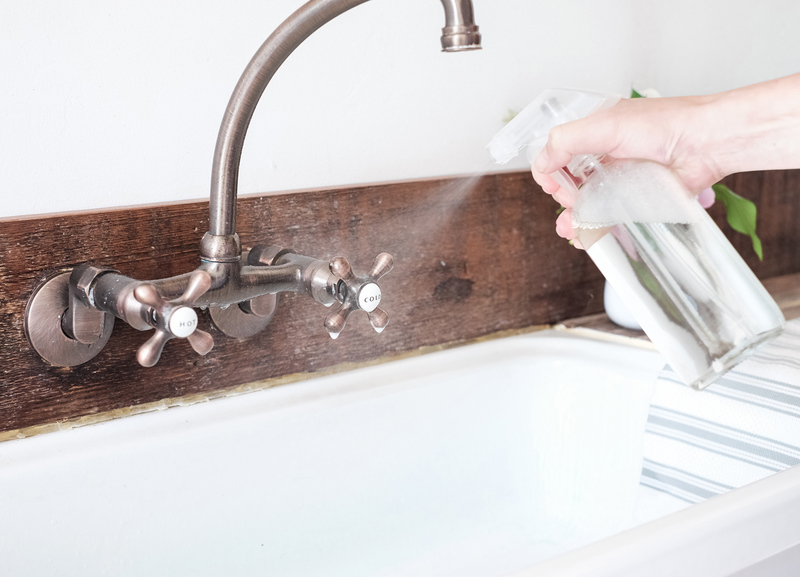 Some may argue that making your own cleaning supplies really only takes a few natural ingredients, and while I fully agree — here’s what I normally used — those few ingredients mixed in with the containers to house the mixtures in, along with rags, sponges, and other cleaning tools can quickly get out of hand. To be honest I was getting completely discouraged about cleaning before I even began cleaning! All of the little bottles and cartons I normally used to make those few cleaning mixes was really taking up a lot of space making it hard to figure out what I had and what I needed. Yes, organization is a big factor here and while I tried my hardest to stay on top of the clutter in the cleaning cabinet, it just became too much for me to deal with. My personality tends to shut down when I have too many choices and visual clutter. Again I’m sure some would argue that it really only takes a few minutes to whip together a few different ingredients to make some but when I’m trying to quickly clean the bathroom with three curious preschoolers underfoot, stopping to make something just isn’t convenient. Rather than being completely overwhelmed by the choices, the clutter, and the supplies I was supposed to make, I decided to just calm the chaos. I just wanted a few simple, well made, safe (and natural as possible) cleaning supplies that would get the job done and wouldn’t add to the visual clutter anymore. To be clear there may very well be a day in the near future where I will go back to making my own supplies, or there may not be, but the point is sometimes we just have to give ourselves grace and let go of some things that sound really good but just don’t fit into our current season for whatever reason. For me, that was to quit making my own cleaning supplies. For you, it might be something entirely different. So what am I using instead? 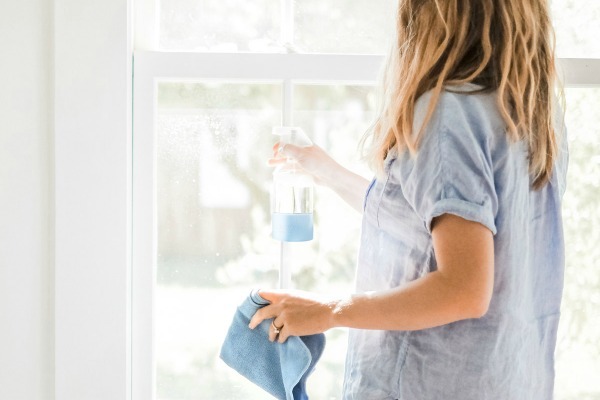 A few high quality, multi-purpose cleaning supplies from companies that I trust to provide safe and natural products that will clean my house efficiently. a multi-purpose cleaner for the bathrooms and the little bit of tile floor we have. 3 microfiber cleaning cloths that work better than any dusty old rags I was using in the past. 3 of these cloths is all I keep on hand now. With these items, I can clean every surface of my house quickly and effectively. Where am I getting these products from frugally? Most natural brands of cleaners are easily more expensive than their competitors on the cleaning shelves at the store. In fact, some can be marked up pretty high making it seem impossible to use them and stay on a budget. 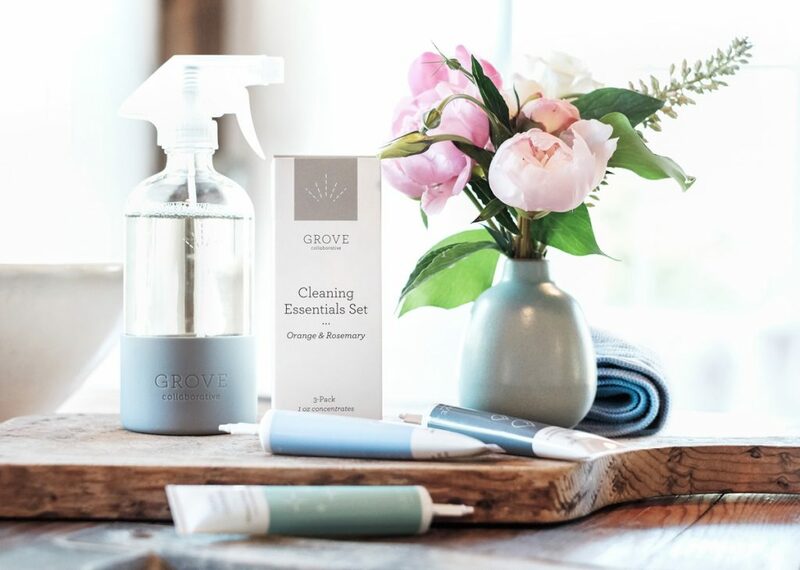 A few years ago I kept hearing from so many about Grove Collaborative and their low prices on natural cleaners. It sounded almost too good to be true so I decided to check them out for myself. Needless to say, I’ve been super impressed with not only the quality and variety of products available (everything from cleaning supplies, hygiene products, candles and paper products) but also their prices. And here’s the biggest turn on for me… you can order online and they deliver to your home! This simple thing actually saves me even more money because let’s be honest for a second here, how many times do you add one or two items on your list and head to Target (or other store of choice) and quickly those few items turns into a cartful of stuff you didn’t know you needed? Sometimes the savings from one item at Target, or another store, doesn’t add up to any other impulse purchases. But when I order online at Grove Collaborative, I can quickly get what I need and move on. My shopping list gets crossed off and my budget stays in tack. Recently I began experimenting with semi-homemade cleaning products that don’t take up extra storage room and clean efficiently. Grove Collaborative has a new line of cleaning concentrates that I’m currently loving. Instead of buying a big plastic bottle of cleaning solution, you just dispense the concentrate into your spray bottle, add water and voilà! If you’re already a customer, you’ll receive a free set of Grove walnut scrubbers — they’re sustainably made and get dishes super clean! – I use mine every single day! In the past, I’ve been known to stretch cleaning products and laundry detergent by adding some water to the bottle. With Grove concentrates, I don’t need to: a 1 oz. tube makes 16 oz. of cleaner! 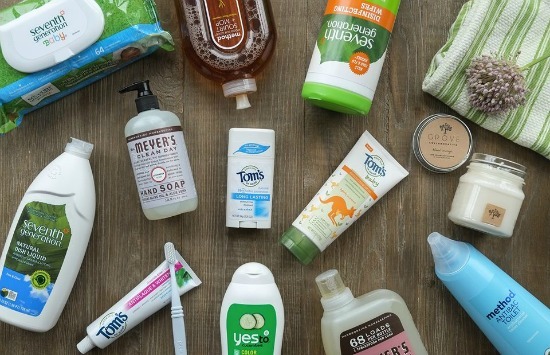 Their products work AND they’re good for the planet. Once you sign up, Grove will deliver your favorite natural products (carbon offset) right to your doorstep, on your schedule. They’ll even save 25 square feet of rainforest for every order! Sign up for Grove Collaborative here. You will receive the Grove Cleaning Concentrates Set for free when you sign up! Existing customers, use this link to receive your free walnut scrubber. If you have any questions at all, use Grove Collaborative’s live chat feature. Their customer service team is wonderful. And they have made the shopping experience super easy and wonderful. They even sometimes have popup discounts like $2 off your order when you answer questions and interact with their customer service. For subsequent shipments, Grove Collaborative will suggest items based on your household’s needs and habits. You’ll get a reminder email 7 days before each shipment is scheduled to go out. It’s a breeze to log in and modify your order or cancel your subscription at any time. I hope you give Grove Collaborative a try, it truly has made my life so much easier! 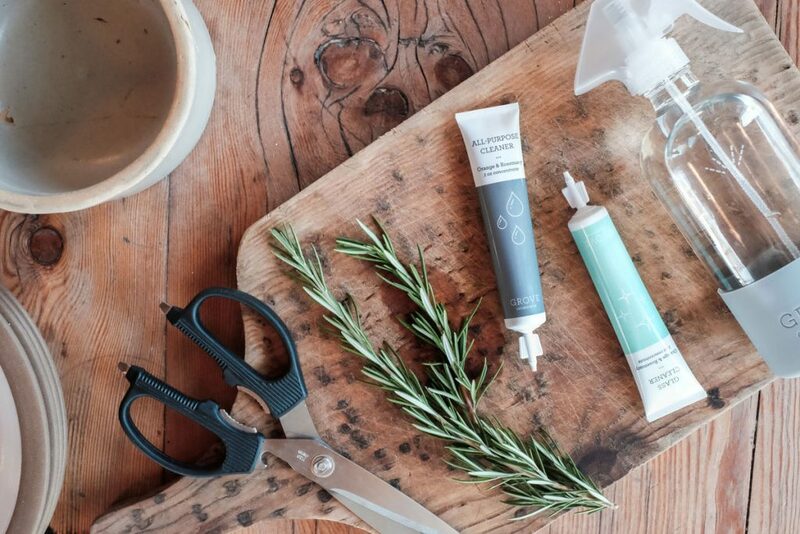 If you have any Grove Collaborative tips or favorite products to share, please tell us in comments. I completely get it! I used to make my own cleaning supplies. I was making laundry detergent, cleaning solutions, glass cleaner, hair gel, mop solution, making things from scratch, baking my own breads (including hamburger buns) etc. I was about to dive into making my own soap. But things got hectic, I was frazzled, and I was exhausted. I am a hypothyroid adrenal fatigued blogging (my blogging has been suffering as well) homeschooling mom of a 4 year old and 8 year old. Plus my hubby is going to college and working 40 hours a week. I just don’t have as much time I did and I also needed to simplify. I was trying to be wonder woman and I’m not. I was stressed and falling behind very quickly. Something had to give and it was giving up some of my homemade stuff. I haven’t completely converted to buying everything. I still make my own toilet bowl cleaner, mix my Mrs. Meyers all purpose cleaner (water + all purpose solution lol), and mix my solution for my Ready Mop, but all of these are pretty simple. While I was proud to make my own stuff, loved how I controlled the ingredients and maybe someday will return to it, I just needed some pressure taken off and some down time. So I’m here to say don’t feel bad! Your not the only one! Life happens and things change.While I have given up most of my DIY non toxic cleaning supplies, I still want natural non toxic products. I generally order from Vitacost or Amazon, I’ve never heard of epantry but I’m going to check it out! Oh by the way, I also blogged about making my own cleaning stuff as well lol. You should try e-cloth. Very similar to Norwex but half the price or less and free shipping. I don’t use glass cleaner and rarely even use multipurpose cleaner anymore, just e-cloths and water. And I love theie mop and dustmop. Sounds like you have done just that. I am validating your decision. Hope your blog inspires other mothers. I know this is a practically ancient post, lol, but I just wanted to let you know that I decided to give Grove Collective a try. I can’t wait to get my shipment next week and see how I like the products! Yea! That is so fun, I hope you enjoy GC. I always look forward to my monthly shipment, even though I know what’s in it! Who knew getting cleaning and home products in the mail could be so fun? LOL ? Such a great post! My intentions can also get in the way of creating and keeping the calm and balance in my life. It IS ok to wave the white flag sometimes. It doesn’t mean we don’t care, but we have to have to weigh the pros and cons of our intentions sometimes to keep our sanity.